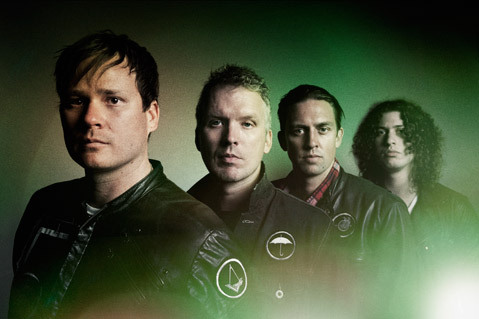 Angels & Airwaves alight upon the Velvet Jones stage this Wednesday, January 25. THIS IS THE NEW YEAR: Much like the rest of the world, the music industry tends to shut down for the holidays. And, as we all know, it often takes a while to get back in the swing of things. As a result, it’s this week and next that the scene seems to have fully and finally regained its footing, boasting a series of live-music events that are sure to draw crowds. This week, New Noise busts out the first of many big guns for 2012. (They’ll host Florida’s Surfer Blood, Goleta-born punkers Lagwagon, and S.B.’s own Gardens & Villa in the coming months.) On Wednesday, January 25, though, they’ll bring radio rock staples Angels & Airwaves to Velvet Jones (423 State St.). While many know the band for famous frontman (and Blink 182 guitarist) Tom DeLonge, Santa Barbarans may very well have a different point of reference. Last year, the band joined forces with friend, filmmaker, and Santa Ynez native Will Eubank for Love, a sci-fi drama that the band produced and scored. While the film earned rave reviews throughout its debut and run at the 2011 Santa Barbara International Film Festival, Wednesday will mark the band’s first full-blown Santa Barbara tour stop. For tickets, visit newnoissb.com. On Wednesday, January 25, New Noise, Numbskull, and the Mud team up to host Chicago experimentalists A Lull. Contrary to their name, these five deliver a stirring and percussion-heavy take on indie rock that’s reminiscent of Animal Collective or The Annuals. Better still, their live shows are rumored to be quite the energetic affairs — a rare feat among the many bands now dabbling in this form of tripped-out electro psychedelia. A quick scan of YouTube proves these fellas worthy of the hype, though; they’re creating all their bleeps, bloops, and unrelenting beats live, and true to their recorded counterparts. Catch ’em when it all shakes down at Muddy Waters Café (508 E. Haley St.) on Wednesday, January 25, at 8 p.m. with openers Deleted Scenes and Ravenna Woods. Visit newnoisesb.com for info. Also this week, longtime Santa Barbara frequenter (and SoCal native) The White Buffalo returns to SOhO (1221 State St.) for a set’s worth of somber and introspective folk rock. Never mind Buffalo’s (birth name Jake Smith) rugged, lumberjackish appearance, this singer/songwriter is all heart, calling to mind the heartbreaking and heartstring-tugging work of minds like Bon Iver’s Justin Vernon and Fleet Foxes’ Robin Pecknold. While Smith has for many years only laid claim to a sparse, independently released EP, 2012 is fast becoming his year to break free of the underground. This February he’ll release his long-time-coming debut full-length, Once Upon a Time in the West. As those who’ve caught Smith in action will tell you, his live set is not to be missed and rare to be forgotten. And as an added bonus, Ventura loc — and all-around folky genius — Seth Pettersen will open the show. The White Buffalo plays SOhO on Friday, January 20, at 9:30 p.m. Call 962-7776 or visit clubmercy.com for tickets. DOWN IN THE VALLEY: If a psych-rock party is what you’re after, look no further than Muddy Waters for your fill. This Saturday, the Haley Street haunt welcomes back San Fran noodlers Zodiac Death Valley (ZDV). An up-and-coming act in the best of ways, these five are yet another who seem destined to hit it big before long. Their sound is a twisted (but not too twisted) mix of garage-y jams and old school, Haight Street–approved psychedelia. Better still, unlike many who dabble in the field of throwback classic rock, ZDV are not ones to simply regurgitate what has come before them. The licks, while Doors-esque in tone, often give way to sweet and sentimental lyricism, and the rock drum punch is just as likely to hit hard as it is to give way to a shanty-inspired waltz. In short, it’s musical hybridization done right. Zodiac Death Valley play an all-ages show at the Mud on Saturday, January 21, at 8 p.m. Call 845-1776 or visit newnoisesb.com for tickets.